first day of pre-k for Em! i somehow had the foresight to take today and tomorrow off of work; if i hadn’t i surely would’ve been so distracted i wouldn’t have gotten anything done anyway. my husband was able to go in late this morning too, so we all walked her to school which was great! she skipped…SKIPPED to school. she was SO excited. i was actually really nervous about today. she’s my first little one going to school, and i just have all sorts of feelings about how i don’t want school to mess with her. i had a rough time with being teased and just feeling constantly awkward in middle school especially, but i’ve been telling myself she’s only in pre-K, the school is full of really nice people, she’s there with three of her cousins (one is even in her class) and she already knows her teacher because her son goes to the same babysitter…she’ll be fine. she loves learning and playing with other kids her age, so she’s totally ready for school; it’s just that i’m not quite there yet! sometimes when i’m stressed, i make myself super busy so i don’t have time to think about what’s stressing me out. for instance, i decided she needed a handmade backpack last week and let her pick out the material. i figured, once again, if she will be wearing a uniform, she needs a super Em-like backpack. 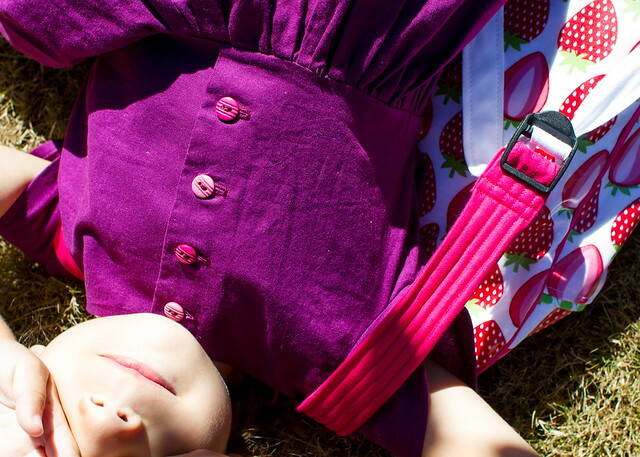 she chose this very cool strawberry laminated cotton by timeless treasures, with pink piping and a pink zipper. 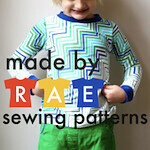 it’s the Made by Rae toddler backpack pattern. i enlarged it to school size per Rae’s instructions, basted canvas to the laminated cotton for structure, added a split pocket in the front, a patch pocket on the inside, and fully lined it in this green wicker print by michael miller that i’ve had for ages. i sewed everything except the lining with my walking foot, which worked great. the backpack is not a quick sew as i mentioned before, but it is SO satisfying when it’s done! since we were out of town for the labor day weekend, i didn’t finish the backpack until monday afternoon as naptime ended (well, aside from hand sewing the lining). but on my way home…i had also decided i needed to make her a dress for her first day (she doesn’t have to wear a uniform for the first two weeks, which gives me more time to procrastinate/sew). i stayed up until almost 2am finishing the backpack and making the dress – so worth it. i poured a lot of love into the dress and made it just for her to feel good on her first day. 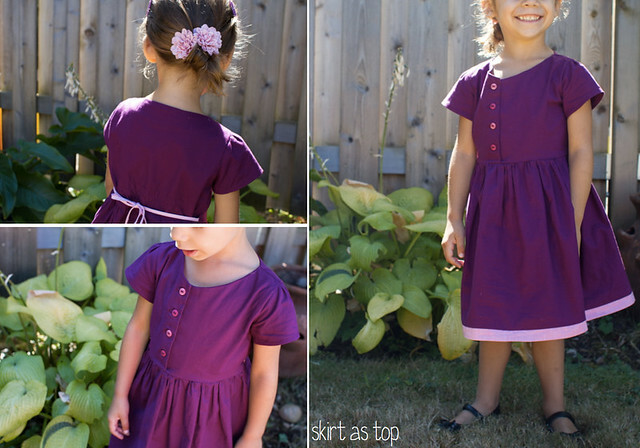 it’s in pink and purple, her favorite colors, with a full twirly skirt, pink buttons, pink bow, and pink trim! i had even picked up a couple H&M flower clips for her hair. the pattern is my own design, the same one i made for her amelie dress (which she loves) but with the back tie and a few tweaks. shirring wasn’t working for me last night and i had wanted to try a tie anyway, so that helped take away some of the boxiness while keeping it comfy. i think i might make this available as a free pattern/tutorial sometime in the future, if people are interested..
the tie is bias tape, the bottom band is shot cotton, and the fabric is kona cotton…i really love how it looks on her and of course she loves the colors. she had a great first day at school (they played dress up, had story time, took a walking tour of the school…important stuff). it was strange for me just being home with O all morning – I haven’t spent much one-on-one time with him like that for a long time, since Em is usually around! neat to have that time with him now that he’s really starting to turn into a little chatterbox. the one time i teared up was when he asked “where Em go?” this morning! argh! hope all you mamas sending your little ones off to school are making it through okay! What a sweet post. Happy first week of school to Em! It makes ME tear up imagining you looking back on these first day pics some day. How special that she started school in such lovingly-made handmades. Miss you guys. aw thanks, girl. i miss you too! Happy first day of school to em! The dress is gorgeous and so is the backpack. Love her dress and backpack and this post! 🙂 And your button holes look millions of times better than mine. Nicely done!!! The bag pack it’s soooo cute I want to try to make one but after a bad experience with one I put it away and haven’t had an inspiration to try again!!! The dress, the colour you picked just suits her perfect!!! Excellent job!!!!!! 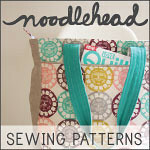 I’d be totally interested if you would really be willing to provide free pattern/tutorial — it’s so cute!! Oh my goodness, she looks so sweet in her dress and backpack. I can tell you poured a lot of love and mommy vibes into getting her prepared for school. oOooOoh, LOVE! The dress is adorable – I really love the color and that back tie is perfect. I can imagine Em will be wearing this a TON. And that backpack!! Nice choice with the fabric, Em! I’m sure she’ll be using it for a long time too (lots of room for her to grow into it)! So yes, I’m sure it took a lot of time and you had to stay up late, but totally worth it. And such fun pictures and memories of the first day! I’m sure she’s going to have soooo much fun at school. And she’s going to be the best dressed kid for the next two weeks, for sure! thanks, Cherie!! i bet she’ll wear it a lot, too. 🙂 i got my first glimpse of how “different” she looks in her handmades compared to the other kids, though. there was this flash that she may not let me sew for her forever, so i’d better make it count! love the backpack, coolest ever. and that dress, so so sweet! Love the details you added. And man, isn’t it a weird feeling when they go to school? I remember my Emily asking where Natalie was the first day of kindergarten last year. Oh and that mother protector feeling, I totally have that. I probably ask Natalie waaayyyy to many questions about how things went and who she played with, etc. But I just want to know that she’s doing okay and that no one’s being mean. I probably should take a chill pill. What an awesome mom you are!!! I love that strawberry fabric! And a little purple dress being made until 2am?! All my kids got were handmade resizable lunch bags and napkins 😦 Now i feel like I need to whip them something up by thursday for their second day of school! 😉 Great job!! that purple dress looks purplicious!! 🙂 And, I’m thinking I’m definitely going to have to make V one of these backpacks next year for kindergarten! They are just too darn cute! Awww, I love how you sent her off to school covered in items made with love. So incredibly sweet! And such a beautiful dress and backpack! Love Em’s first day attire:) Awesome job!!!! and one more thing- now that I am looking at this on a real computer and not my iphone, I literally want to gobble up this dress! Its so cute and the colors look completely delicious! Damn it’s a cute dress Kristen!! OOOkkkayy, I just realized that the long endearing message I sent earlier didn’t go through 😦 So let’s see if I can remember what I said. One: Well, the dress (and the backpack too!) is so super cute! I just adore the button placket in the front! I really have to try that sometime. Two: I remember Azriella’s first day going to school on the bus when she was 3. As soon as I turned around I started crying! I didn’t have Sephira then, so I was all alone for those three hours and it was really weird, and I really missed having my sidekick around, you know? I bet you feel the same way about Em. And that is so adorable what O said. All day these days, Az runs around saying that me, daddy, and baby are her best friends in the whole wide world and I wouldn’t have it any other way!! Gahh, it’s so hard when they become little independent beings and not our little babies! I keep telling Azriella to stop growing so that she can stay my little girl. Sigh* And what a cute image of Em skipping to school! I had a third point but I might have combined it into point two. Argh!!! Well! I can’t wait to see what you whip up with your “down time” ha! cute dress, cute backpack and cute girl! ADORABLE! Your sweet girl, the dress, the backpack, O, the stories, the pictures, everything! Hang in there, mama! There are a lot of first days of school ahead! The dress turned out really cute.mthe back tie is great. My 4yo starts preK on Thursday. I can’t wait to have both kids at the same school and she is very excited to go to her sisters school. I made Ev a skirt this weekend and started J’s skirt tonight. I worry so much about mine at nursery I can’t imagine what state I’ll be in this time next year when my eldest starts school! Beautiful sewing again – you are so talented. Please please do make your dress pattern available. I’m always looking for dresses with sleeves to keep my girls warm here in the UK! Oh, she looks so happy and lovely. I love that she chose the fabrics for her backpack and she’s skipping off to school! I also have a lot of anxiety about the way that I was teased growing up – I’m always worrying that Joe will struggle socially because of his speech issues or because he’s really shy or whatever. I have to remember I’m projecting a little there – just because I had a hard time socially growing up doesn’t mean he will. And his awesome climbing and throwing skills will definitely help him out. 🙂 Aw, our babies going to school! She looks so sweet- mine started yesterday too…I had no idea what to do with myself and just one kid. Weird. 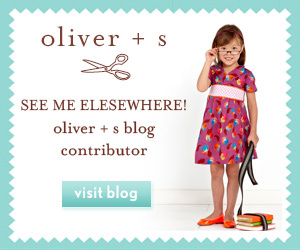 Love the backpack, and the dress….consider me interested- i’d love to make one ASAP! Both are absolutely gorgeous and now I feel so bad that my girl is starting school on Friday without a lovely dress as lovely as the one you sewed your daughter. 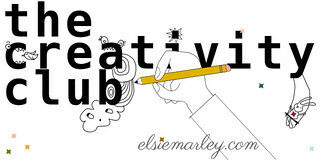 There is still time… I would adore that free pattern download. It is awesome! So pretty… the school is going to want to change their policy after seeing Em coming to school so cute each day these 1st two weeks! And I am going to feel the SAME way… I have issues with school. I don’t know what I’m going to do! Good thing mine’s only 2! Again, definitely interested in the dress pattern! Love it. I’m so glad that Em’s 1st day was special for her! A walking tour, story, and dress up?!? Perfect! And all while looking so cute! 🙂 Good work! Totally know how you feel about school. I got teased a lot, especially in middle school, and I am definitely *not* of the philosophy that it’s good for kids. Read “Raising Cain” and it’ll break your heart. Every end of summer I contemplate homeschooling but every year I decide to send them (so far). 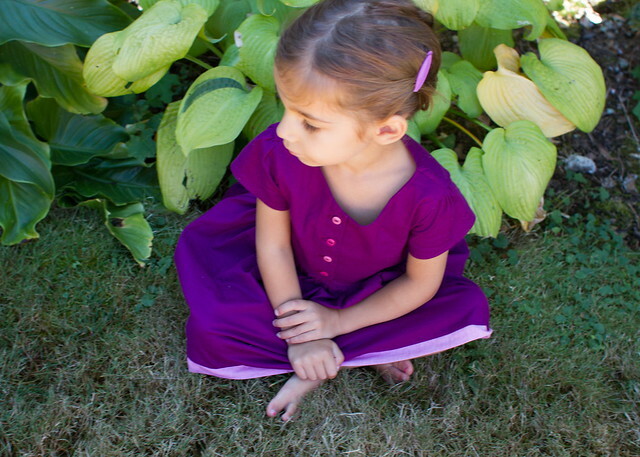 Indigo, only a kindergartener, had a little girl tell her she didn’t like her dress. They wear uniforms! Broke my heart. It’s always a good reminder for me and lesson for her that we cannot ground our identities in what others think of us. 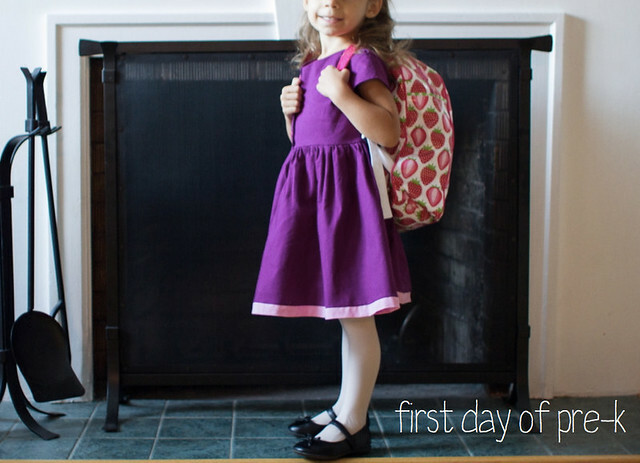 aw, she looked all sorts of sweet on her first day! and i love that you stayed up til 2am making her a new dress…of course you did! bet she loved having purple and pink to wear on the first day, and the tie in the back is a great addition to the dress. 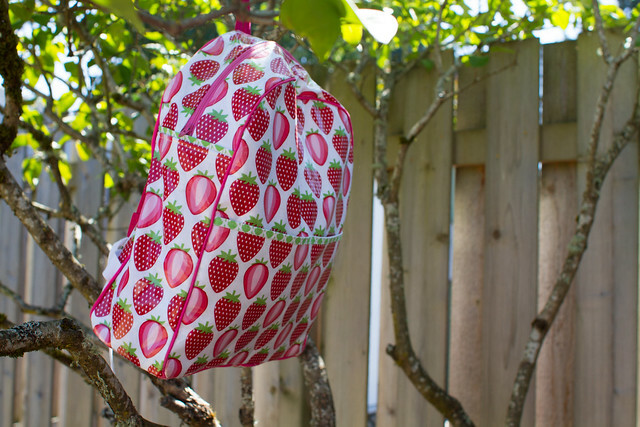 the strawberry backpack is sooooooo cute, i love that wicker-esque lining fabric! yay for skipping to school on the first day!!! You are such a sweet mama:) To me, sending her off to her first day of school with a handmade backpack and dress is sending her with a little bit of yourself. I empathize with your angst – I had the same experience yesterday, but in my case, it was sending my youngest off to preschool and I didn’t get to come home to another toddler at home:( But, like you, I made her a backpack to try to ease the pain (mine at least:). Love the colors of the dress – so rich. And yet another push to track down some of that splendid shot cotton! That backpack material is definitely something I would have chosen at Em’s age! I love that she skipped to school. Congrats on making it through the day! 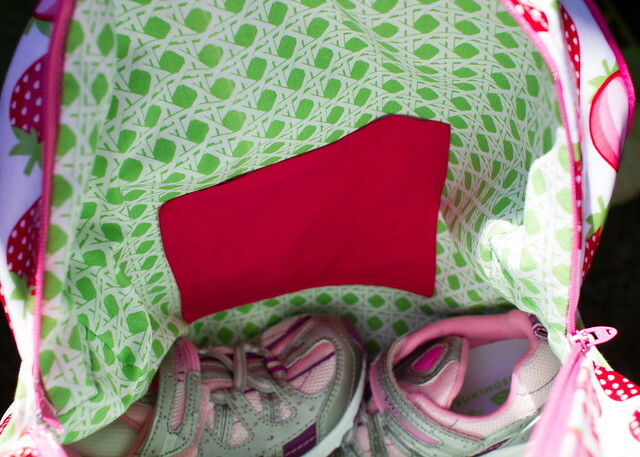 What a perfect send-off you gave her;) I love this back pack and the fabrics you chose. I love the dress it’s adorable!! very impressive. Especially the backpack! That’s nice they can wear clothes of their choice before the dreaded uniforms come. Love the dress with the contrasting hem and ties! I’ve told you on fb how adorable this ensemble is, but I’ll say it again: I love it!! Everything about it is cute, and Em looks so good in purple! I bet she loves her strawberry backpack too. You are so talented! Happy school year, Em! What a lovely mama you are. Great fabric choice from Em for the backpack and the dress is gorgeous. So sweet that she skipped to school. I really want to make a backpack before C’s first day at school. I have a year so should manage it. Love that backpack. Love that dress. LOVE that girl. We really showed B huh? Adorable! 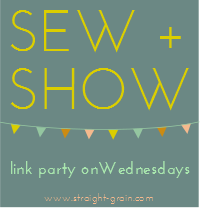 I would love to see a pattern and tutorial for it – I’m just starting to sew clothes but I think I could maybe handle this one…. This is so nice :)! Seriously awesome stuff! She is such a lucky girl. 🙂 hope the rest of the first week went well for everyone! 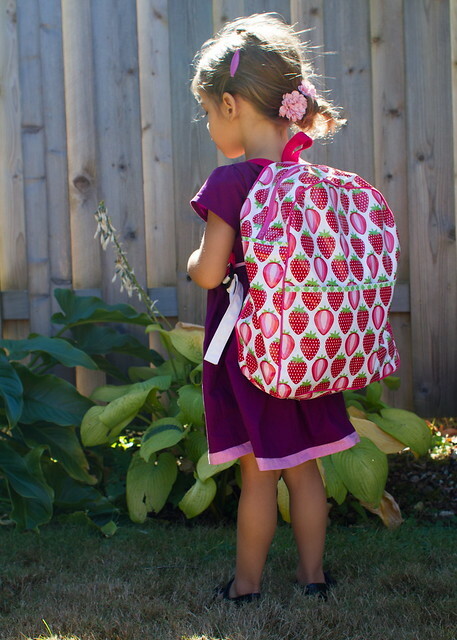 All of my kids have store bought backpacks (like all of their mates, of course), but to be honest none I’ve seen are as great as yours – I so wish I could persuade them to let me give this pattern a try! The backpack is a showstopper! Perfection. Fabric source please? I am pinning it, so that if I am ever so ambitious, I will remember this post. The purple dress is simply adorable. Congrats on making through the first week of school, I know its tough to let your little birdies go. I remember that worried feeling the first time my son went to preschool! My three year old took her first pony ride yesterday and I had the same feeling. I bet your daughter was one of the best dressed kids at school and I’m guessing plenty of parents wondered where you got that sweet backpack. What a pretty dress, who wouldn’t love it! 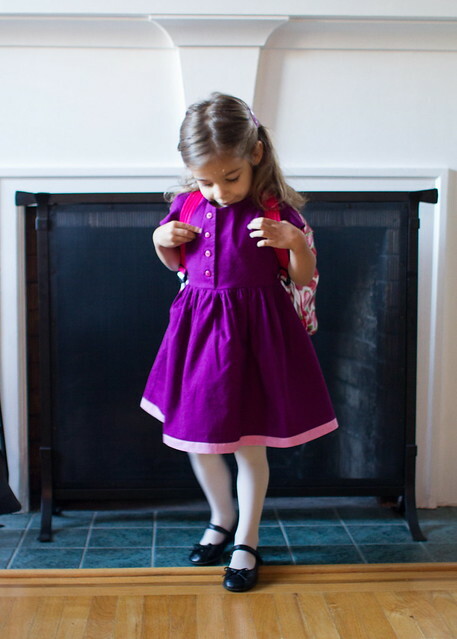 Love the dress, love the backpack–love the way she crosses her little legs! Such a ballerina! And yay for good button holes. They always make me crazy. she’s so stylin’! Love the dress and backpack-I know I’m probably going to “need” to make Sadie one when she starts pre K in January! she looks very proud in her darling outfit. 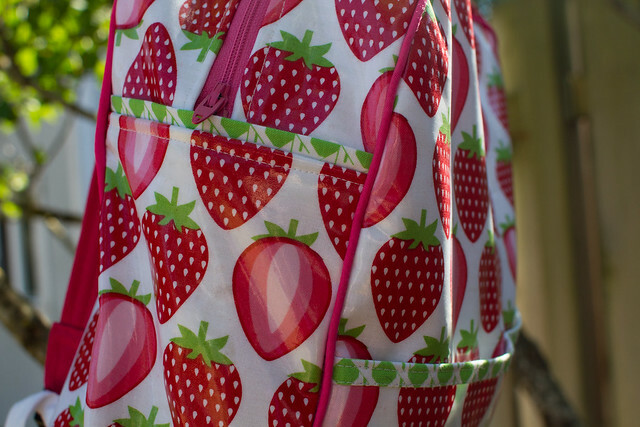 not to self for future “first day outfits”: strawberry backpacks make every outfit pop!